It was finally Sunday at Pine Hills Girls’ Camp and our staff had prepared for months to welcome 192 campers. This year, I was privileged to be a part of that staff. As I was putting on my camp t-shirt that morning, marked with our theme of Be The Light, I thought, “This seems pretty self-explanatory. Maybe the talks won’t apply to me this year. They’re probably geared more towards the girls.” Woah, was I wrong. The call to be God’s Light in the world is for every person, at every age and every stage of life! 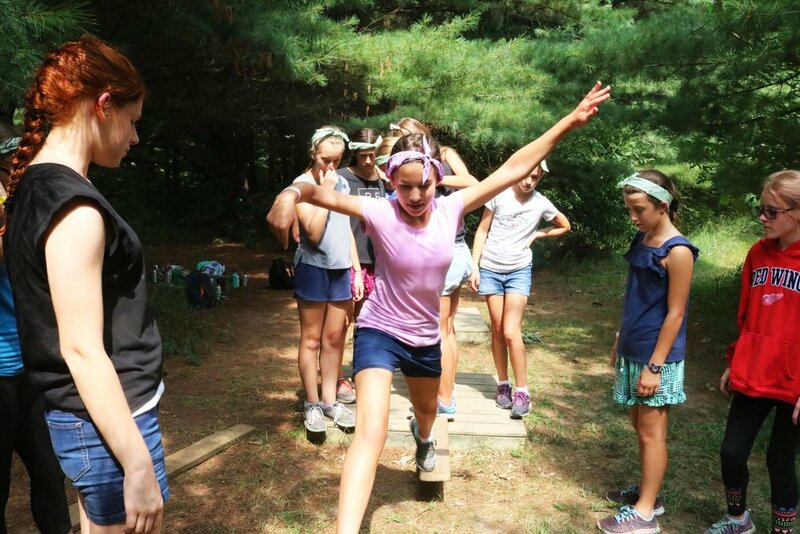 That Sunday afternoon as 192 girls arrived (every bunk in every cabin was filled), our Senior Service Team (SST) and the Service Team (ST) welcomed them to camp and helped get their luggage to their cabins. Those two hours were some of the craziest and fastest to go by in my life. I wondered how this could ever get old. I felt completely in my element and full of joy and energy. However, after the initial excitement of camp (what you have looked forward to all year) dies down, and the fatigue of mid-week hits, the real work begins, authentic love is tested, and the living God becomes present. Work at camp is a beautiful thing. You realize that you’ve never loved working so hard, so much! You’re exhausted, but you feel like you’re in the perfect place. Our work at camp is a prayer. We submit ourselves to Jesus and He is there in each setup and clean up, in every workshop, small group time, team building exercise, and every walk to and from the cabin as we begin and end our day. At camp. we wake up each morning and very simply decide that we want Him with us. We accept His invitation and make Him present in everything. What a wonderful life for the camp week. The challenge begins when we get home--surrounded by many people who do not make that choice in their lives. As we say at camp: we can’t be in the bubble forever; we need to go out and live this reality. We all memorized our theme verse this year: “I am the light of the world. Whoever follows me will not walk in darkness but will have the light of life” (and that’s from John...8:12). The staff spoke to us about Who “the Light” is and how we can let Him shine in us and bring it to others. We heard about the very real struggles to love ourselves, and how God’s light within us reveals to us who we really are and that we are so abundantly loved. As the week progressed, it was so beautiful to watch these truths take hold in the campers (and staff). A mantra for the SST when we were experiencing spiritual attack or darkness was: “He has already won.” We would make fun of the lies. They simply didn’t belong to us; we didn’t want them. One of the best nights was after the prayer party on Wednesday. My team and I had a small group time with our leaders. We sat there talking about the things we had experienced and a few of us shared a common theme. My friend Meghan spoke up and said, “The Devil has really been trying to crush my joy. He’s trying to tell me that the goodness I’m feeling right now is a lie.” Another girl spoke up, and another, and I was also prompted to say some words as I had been receiving similar lies. Satan was saying things to us like, maybe Jesus isn’t real. Maybe this is all a hoax and we’ve been fooled. I was frustrated that the Devil would try and get close to my team and my friends. But I was brought to the realization that we had done the right thing. We brought these lies into the light. We prayed against them, claimed the victory over them, and moved on. Because the fact is, lies don’t deserve airtime. Throughout the rest of the week, we took this practice into our small group. We brought things up that were loading us down and we would fight the battle together. I realized then that being the Light is a whole lot harder than I thought. It’s not a “camp thing”, but my whole life must be dedicated to this action. Pine Hills Camp can never be summed up in a few paragraphs or in a week. PHC is something that lives in our hearts not only as great memories, but it is the catalyst for strong, life-long friendships, the foundation of support and the training ground for our relationship with Jesus. Every young woman who came this year left exhausted yet refreshed, fully emptied yet full to overflowing. Even the YMCA Staff was impacted by the strength of our joy and the Light within us. As we head back to school, we are all going to receive Jesus more fully into our hearts and keep trying to Be the Light. We know that with Christ and one another, we can fight and win the battle! Judah Thomason is beginning her senior year of high school. She is a former PHC camper and is a leader in the Be Love Revolution. She loves Jesus, soccer, her family, preaching the Truth and helping others know God’s love.